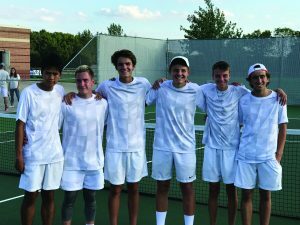 After two rain outs last week, the Rockford boy’s tennis team has been searching for dry courts. Rain on Monday forced the match with Grandville to be rescheduled to Tuesday and rain on Saturday postponed the OK Red Conference Tournament to Monday October 8th. The Rams and the Bulldogs did not let the rain deter their plans to support Mental Health week. Christy Buck, Executive Director of the Be Nice organization spoke to the boys about mental health awareness and encouraged the boys to Notice, Invite, Challenge, and Empower students in their schools. Both teams wearing the navy blue Be Nice t-shirts then hit the courts to compete for a conference dual match win. The Rams continued their strong play and defeated the Bulldogs 9 to 0. With the win, the Rams move to 5 wins and 1 loss in the conference and they are looking to challenge for the conference championship at the upcoming conference tournament. Arthur Ma, Nate Boer, Ryan Blackburn, Matthew Hall, Will Lewis, and Caleb Keely. Ahead of the conference tournament scheduled for Saturday October 6th, the Rams invited the Northview Wildcats to the courts. Both teams desiring to maintain their competitive form prior to their conference tournaments battled on the courts. The Rams defeated the Wildcats 6 to 2, sweeping the doubles matches and splitting the singles matches. The match completed the dual match season for the Rams building momentum for Saturday’s conference tournament. Then the rain came again and a dry court could not be found. The Rams are hoping to hold on to their momentum one more day as the conference tournament will now be played on Monday October 8th at Hudsonville. Later in the week the Rams will return to Hudsonville for Regional play to compete for a spot in the State Tournament in Midland on October 19th and 20th.